Profile: The Cornerstone Foundation was founded in 1992 by Jefferson C. McKenney, MD, with Rosanne Lillard McKenney as co-founder. Since that time the Lord has brought together a Board of Directors (both in the U.S. and in Honduras), committed career missionaries, part-time volunteers, and supporting churches and individuals. God has also granted cooperation from the Honduran authorities for the perfect location and full title to the property. Extensive electrical and water supply project have been accomplished as well as that of roads and bridges. The hospital itself and accompanying support structures, such as dormitory/staff housing, kitchen and laundry facility, warehouse, equipment repair building, and the power plant building, have been constructed. Continuing construction goals include sanctuary housing, additional missionary housing & warehouse space, an airstrip, and on-going outfitting, equipping & maintenance of the various buildings in the hospital complex. Travel: You will fly by commercial airline into Roatan. You have two options for travel from that point into La Ceiba. 1. You will be picked up at the airport and taken to the ferry that will take you to La Ceiba. It is a 90-minute ride through what can be fairly rough waters at times. If you have a tendency for motion sickness, please bring prophylactic measures with you. 2. You can opt for a short in-country flight from Roatan to La Ceiba, which is only about 30 minutes long. This flight is arranged upon arrival at the airport. A driver will meet you at either the ferry or airport in La Ceiba, and there you will have the opportunity to do some grocery shopping before traveling the final one hour to Hospital Loma de la Luz in Balfate. Time Difference: -2 Hours Daylight Savings Time (EST), U.S.A., -1 Hour Eastern Standard Time We are in the Central Time Zone, but do not practice daylight savings time. Location: Loma de La Luz means the Hill of The Light. 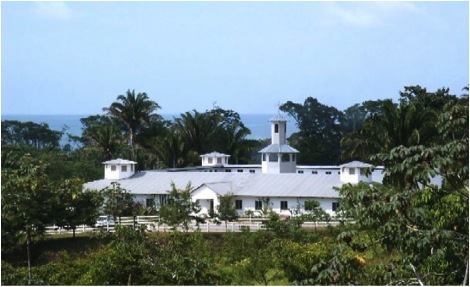 Hospital Loma de La Luz is located 37 miles east of La Ceiba and is situated on a hill overlooking the shore of the Caribbean Sea. Due to rough road conditions the drive from La Ceiba to the hospital is approximately 1½ hours. People: Miskito Indigenous live in the southeastern section of Honduras. Other groups include the Xicaques, Torrupan, Lenca, Chorti, and the indigenous of El Paraiso, which reside in the higher elevations of western Honduras. The Paya and Sumu live in the same region as the Miskitos; some of their tribes have integrated with the Miskitos. Major Miskito, Sumu, and Paya settlements are located on the Caribbean coast from Rio Platono to Gracias a Dios. These groups have experienced the most isolation of all the indigenous groups in Honduras. Language: Spanish is the official language. It is preferable that medical personnel be fluent in Spanish. Interpreters are not always available. Religion: Although 95 percent of the population is considered Roman Catholic, it is extremely unlikely that most of these will have read or heard even the most basic precepts of the faith. Climate: Honduras is very hot and humid. A light jacket should be taken for evenings and in the higher elevations. Housing: All visitors stay in the staff housing facility. It is equipped with dorm rooms and a common kitchen. Studio apartments are also available within the staff housing facility which provide a small refrigerator and in-room cooking. Food: You will be responsible for preparing your own meals, unless invited to take your meals with a visiting work team or with a missionary family. Clean-up is also your responsibility. Filtered water is available. All water on the hospital compound is potable. For More Information: Contact Sandy Souto by email or by phone at (828) 278-1006. World Medical Mission believes in treating the whole person. Our two-fold purpose is to minister to the physical needs of the sick and suffering while sharing the Good News of Jesus Christ. As the medical arm of Samaritan's Purse, we place volunteer Christian physicians, dentists, and other medical personnel in mission hospitals and clinics around the world. We also staff a biomedical department and warehouse that provides critically needed medical equipment and supplies to medical mission facilities. World Medical Mission was established in 1977 to assist general surgeons who wanted to volunteer for short-term mission trips. Today, hundreds of volunteer Christian healthcare professionals serve in overseas mission hospitals and clinics. We also ship critically needed medical equipment and supplies and send our biomedical technicians to install, repair, and maintain the equipment at these facilities. As doctors work to save lives, they bring the Good News of eternal life through the Great Physician, Jesus Christ.